News and Events Champagne and Pearls… and School Supplies! Champagne and Pearls… and School Supplies! Champagne… the iconic beverage of celebration, and pearls… the beautiful and classy adornment treasured and worn by women everywhere… so what do these things have to do with school supplies?? Clara and Mrs. Patty Jo assisting with donations. For St. Francis Villa’s Champagne and Pearls Society, champagne and pearls are symbolic of our city and its ladies. We KNOW how to celebrate, and we know, just like the pearl comes from pressure inside an oyster shell, that the most beautiful things in life sometimes are borne of difficulty. 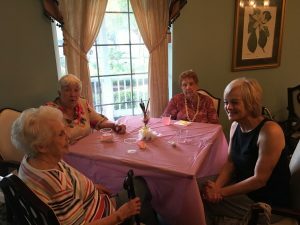 The Champagne and Pearls Society is always looking for a way to make a difference in our community, to brighten up a difficult situation, and to celebrate, of course! Hazel Park Students ready to serve lemonade! As back to school sales appear, our hearts turn toward our community’s children and teachers. 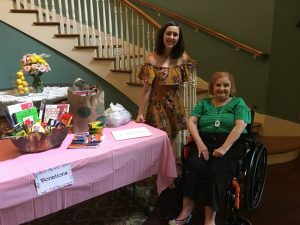 The Champagne and Pearls Society decided to host a lemonade stand (because what is more adorable than a lemonade stand hosted by grandmas?) 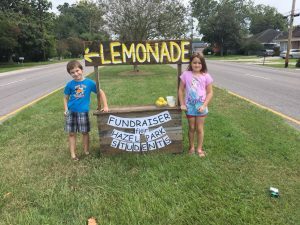 and invited the community over to enjoy free lemonade, with a splash of champagne, of course, and to contribute supplies or cash for the teachers and students of Hazel Park, Hilda Knoff Elementary School. Some of our residents’ children attended Hazel Park over 50 years ago! We couldn’t think of a better place to reach out than our own neighborhood school! 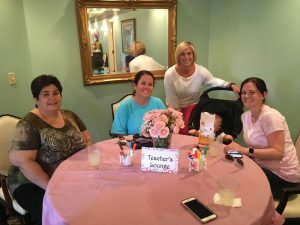 A special “teacher’s lounge” area was set up for the school teachers and their principal, Meredith Legasse. Residents, teachers, parents and kids all came together to enjoy some sweet treats and refreshing lemonade. We collected quite a haul of supplies, and cash donations, too! The community did a fantastic job donating supplies. 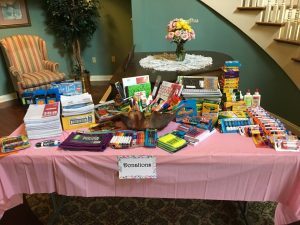 The supplies and cash will be used by Hazel Park School to help students who struggle to afford supplies or supply fees, and to help lighten the burden of personal spending that teachers so often must contribute in order to help their students succeed. Champagne & Pearls Society Ladies enjoying the ‘Adult’ Lemonade! Want to join the Champagne and Pearls Society in their endeavor to support our local school? It’s not too late! Residents will be visiting the school to deliver our gifts the week of August 22, so you have until then to stop in and bring a donation of money or school supplies. Contact Shannon at 504-738-1060 or email sreale@stfrancisvilla.com .